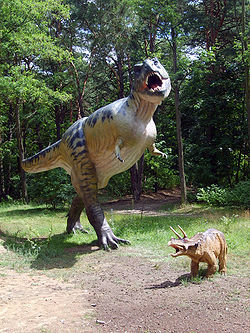 Tyrannosaurs (from Greek τύραννος, tiranos and σαῦρος, sauros, meaning "tyrant lizard") belong to the theropods. Tyrannosaurids comprise the family Tyrannosauridae, a group of 16-39ft dinosaurs of the supposed Late Cretaceous period. 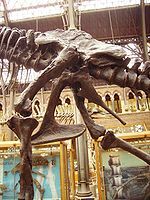 The Tyrannosauridae included such similar as Albertosaurus, Gorgosaurus, Daspletosaurus, Tarbosaurus, and of course Tyrannosaurus rex. 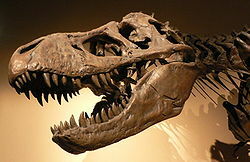 Remains of tyrannosaurids have been found in North America (including Alaska), India, Mongolia and Japan. Tyrannosaurs are surprisingly common in many North American fossil beds, especially their large, serrated teeth, which they shed periodically like most archosaurs. Tyrannosaurs are lizard-hipped dinosaurs (Saurischians). Size comparison between different genera of the theropod dinosaur superfamily Tyrannosauroidea. Graph of tyrannosaurid growth rates. These two-legged carnivores had huge heads filled with teeth up to 7 inches long. Tyrannosaurids had short tails and huge muscular rear limbs with three toes. Short but deep jaws with banana-sized sharp teeth, long hind limbs, small beady eyes, and tiny forelimbs (arms) typify a tyrannosaur. T. rex was one of the largest terrestrial carnivores of all time. It stood approximately 15 feet high and was about 40 feet in length, roughly six tons in weight. In its large mouth were six-inch long, sharp, serrated teeth. Most large living predators do scavenge meat happily when it is available, but most do prefer fresh meat. Its arms were too weak to grab prey, but sharks, wolves, snakes, lizards and even many birds are successful predators without using their forelimbs. Creation scientists typically interpret the Earth's geology as the result of the Biblical flood of Noah. The Tyrannosaurs, like all dinosaurs, are believed to have perished during this catastrophe, but were reintroduced following the flood and became extinct subsequently. Soft-Tissue Vessels and Cellular Preservation in Tyrannosaurus rex by Mary H. Schweitzer, Jennifer L. Wittmeyer, John R. Horner, Jan K. Toporski. Science Vol. 307. no. 5717, pp. 1952 - 1955. March 25, 2005. Still soft and stretchy: Dinosaur soft tissue find—a stunning rebuttal of “millions of years” by Carl Wieland. Galloping Giants: Was T. rex a speedster after all? by Carl Wieland. Creation Ministries International. Accessed July 19 2010. This page was last modified on 4 November 2012, at 07:24.